Madellaine: Quasi, listen to me. I know I hurt you. I'm sorry. But I am someone you can trust. Quasimodo: [turning away from her, sorrowfully] How can I? I've already made that mistake. Madellaine: Quasimodo, there's more to me. Madellaine: Quasimodo, you've shown me that the world is full of miracles. Quasimodo: Just ordinary miracles. They happen every day. 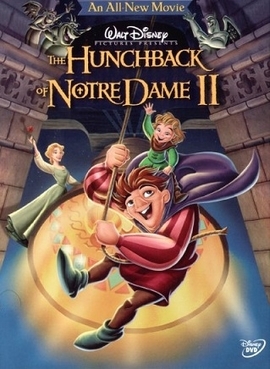 Quasimodo: [after he and Madellaine find out that La Fidele has been stolen] Did you know about this? Madellaine: I-I wanted to tell you, I tried. Quasimodo: [mimicking Madellaine] "Which one is La Fidele?" "Let-Let's go for a walk". You never cared about me! Madellaine: [protesting] No, that is not true! Quasimodo: [storming away] You were right. Madellaine: [chasing Quasi, who is still storming away back to Notre Dame] No! No, Quasi, please, just-just let me explain! Madellaine: Look at me! Quasimodo, just look at me! Sarousch: [as he and his associates are arrested for stealing La Fidele] Fools, I am Sarousch! This is not the ending I had in mind! Sarousch: No prison can hold me! Wait, we can work this out. Did I mention I do birthday parties? Laverne: And what's the festival - ? Hugo: Or the bell ringer? Hugo: Too bad there's only one of me to go around, eh? Laverne: Ha! One is plenty, believe me. Hugo: Ah, thanks. Hey! Was that a shot? Hugo: [Laverne bonks him on the head] Hey! Zephyr: Who's name will you yell tomorrow, Quasi? Quasimodo: Mm - no one, I guess. Zephyr: Then who's gonna scream your name? Quasimodo: [sadly] I don't think anyone ever will, Zephyr. Zephyr: Well - why not? Laverne: While gypsy girls enchant you with a dance! Hoo-hoo-hoo! Quasimodo: Hey, you were really great up there. Madellaine: Ah, me? Nothing to it, I just have to - stand there and look pretty, you know? La-dee-dum, ho-dee-do, no big deal. Quasimodo: No. No, it-it-it-it is a big deal. You-you have to make the audience look when they're supposed to, not give away the trick. Madellaine: Hm, you mean - hocus their pocus? Phoebus: [entering Esmeralda's tent] That circus is responsible for a string of robberies. Esmeralda: Those people? How can you lump people together like that? Phoebus: But the gypsies weren't guilty of crimes like these circus people. Quasimodo: [sternly] Madellaine's not. She's different. Phoebus: Well, maybe. And maybe she's just using you to get something else. Quasimodo: You don't think she could be interested in me? Just for me? Phoebus: Well, yes... of course, anyone could, but look at the facts. Quasimodo: Find some! Then I will. Quasimodo: Paris is... really pretty. I-I mean, you - you've - probably seen it already, but then maybe you haven't, and if you haven't then - then - then maybe we could - I could - you, you know... show you. Madellaine: I'd really like that. Clopin: Come, mes ami! As part of the Festival D'Amour, a circus has come to Paris! Quasimodo: [singing] Imagine someone to love who loves you. Imagine to look in her eyes and see. Imagine how extraordinary that would be... if an ordinary miracle - happened to... me. Quasimodo: [as he takes Zephyr's balls and juggles them] I'm sticking to you. Quasimodo: [as he tosses the balls back to Zephyr] Can't help that. We're stuck together. Quasimodo: And we always will be. Always. Zephyr: I thought you forgot about me. Quasimodo: That will never happen. I'll always be here for you. Madellaine: [sighs] You must think I'm stupid. Quasimodo: Not at all. That just means you have an imagination. Madellaine: Do your really think so? Madellaine, Quasimodo: [together] There's something I need to know. Quasimodo: [as hands Madellaine a yellow rose] Madellaine, you know, the festival's tomorrow, an-and I thought that - I mean we could... you know... go? Madellaine: Quasi, I'm not the person you think I am. Madellaine: But I want to be, more than anything. Quasimodo: [sighs lightly] Madellaine, tell me the truth. Quasimodo: [rudely but reluctantly] No. What's so funny? Madellaine: Oh, that - that sounds silly, doesn't it? Madellaine: A - a two ton topper. Quasimodo: [exclaims] I love Madellaiiiiiiiiiiiine! Madellaine: [giggles and exclaims] And I love Quasimodo! Victor: I'm so happy I could just mildew. Laverne: [as she and the other gargoyles watch Quasi see Madellaine leave, he has a euphoric look on his face] Aw, it does my heart good to see our boy like that. Hugo: Yep. He does seem to have a certain savoir-faire. Hugo: I hope it's not contagious! Phoebus: [to Achilles] A string of robberies begins the moment a circus comes to town. Coincidence? I don't think so. How many times have I ever been wrong? Phoebus: Achilles... that was a rhetorical question. Phoebus: [to Achilles] Achilles, do you believe this? Everybody is mad at me. How often does that happen? Sarousch: Oh, did you find out where the monster keeps his bell, trinket? Madellaine: He is NOT a monster, and I am NOT your trinket! Sarousch: What are you doing here? Madellaine: Just standing here looking pretty. Sarousch: [to himself] Ooh, lovely... I'm rich! Rich! I wonder if they make diamond underwear. Esmeralda: Zephyr, you need to slow down. Madellaine: You have a way with kids. Sarousch: [to himself] Which do you think will go better with my eyes? Diamonds or sapphires? Parisian #1: Hey come back. Wait up. Parisian #2: Oh, what a beautiful day. Good morning. Madellaine: [seeing Quasimodo's model village] My name is Madellaine, I'm with the circus, and... oh, I just love bells. Madellaine: Which one is La Fidele? Hugo: [as he, Laverne, and Victor shove Quasimodo out] The bells, you ding dong! She likes the bells! Talk shop! Madellaine: [seeing La Fidele for the first time] Oh, it's beautiful. Quasimodo: Yes, you are. I-I mean, yes, she is! La Fidele, that is. That's her name, La Fidele. "The Faithful One." Quasimodo: But she's even more beautiful on the inside. Victor: [Hands a rope to Hugo] Hold this. Victor: [Hugo drops it and a bell falls on the gargoyles, trapping them] What part of "hold this" was too complex? Quasimodo: What are you doing? Zephyr: Nothing. You were making google eyes at your girlfriend. Laverne: [as she watches Quasi sadly carve a figurine of Madellaine] Are you okay? Quasimodo: No. You saw the way she looked at me. Quasimodo: Do you believe in miracles? Laverne: Miracles? What kind of miracles? Quasimodo: Oh, you know, just ordinary miracles. Laverne: I'm not following ya, kid. Quasimodo: Well, I see people together, couples... and it looks so nice, being with someone who loves you. I guess I'm just wondering if... maybe someone could love me? Laverne: [as she, Hugo, and Victor try to encourage Quasi to see Madellaine] Get out there, sweetie! Quasimodo: [whispering squeakily] I-I-I can't! What might I say? Victor: Open your mouth! Something will come out! Victor: Go to the circus, make a good impression! Hm, what does one wear to a carnival event? Hugo: Daring, ha-ho! Maybe a bit pushy for a first date. Laverne: Quasi, you can stay in here and hope for a miracle, or you can get out there and make a miracle of your own. Quasimodo: [looking at his wooden figures he just carved, Quasi thinks to himself, then smiles excitedly] You're right! I'm off to the circus! Oh, but what am I gonna wear? Hugo: I've got the perfect thing, kid!